This easy copycat recipe of Alice Springs Chicken always gets rave reviews from my family and from the customers at our meal assembly store. It’s easy too! Just assemble, bake and await the applause! If you want to avoid the crowds, don’t feel like dining out or want to save a few pennies, but still want to indulge, I’ve got you covered. My hubby hasn’t seen a lot of bacon lately. But, with Father’s Day just around the corner, I thought I would make him (and share with you) one of his favorite recipes which also happened to be a top-requested recipe at our meal assembly store. Oh yeah. Chicken sits atop a pile of mushrooms. Everything is topped with a fresh honey mustard sauce. Finally, Monterey jack cheese is scattered over some crispy bacon slices. Life is good! 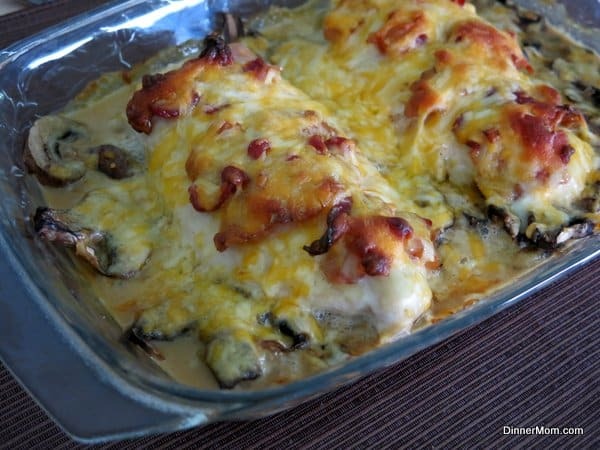 Here’s how to make this cheesy chicken and mushroom specialty. Note that the nutritional estimates below are based on the full fat versions of all ingredients. But, you can make adjustments to meet your needs and I have given you some tips as part of the commentary. 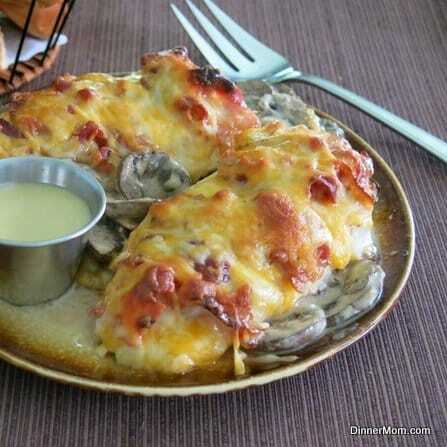 The Best Type of Cheese for Alice Springs Chicken is Monterey Jack! Bake uncovered in a 350 degree oven for about 30 minutes. In the style of Outback, I would suggest serving this with some steak fries and of course, a Bloomin’ Onion. This copycat recipe of the Alice Springs Chicken you can get at Outback Steakhouse will make you think twice about takeout. Easy and budget friendly. Layer mushrooms in the bottom of a baking dish. Add chicken and sprinkle with seasoning salt. Bake uncovered for about 30 minutes or until chicken is cooked through. 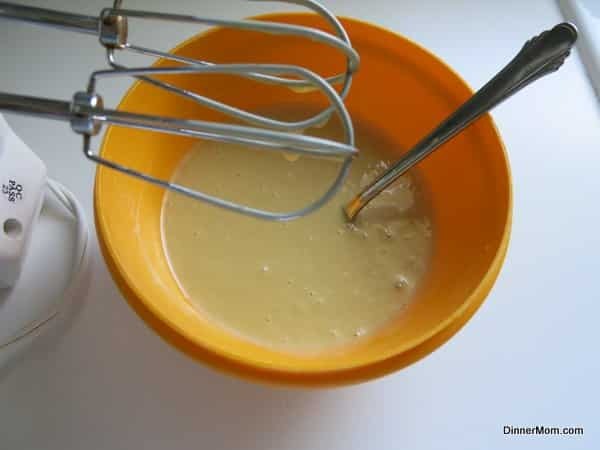 Use beaters to mix mayonnaise, honey and Dijon mustard until well-combined. To lower the calories, use lower fat mayonnaise, cheese and turkey bacon. Outback, upstate, wherever…THIS is a Deelish recipe !! I’m thinking an Alice Springs Chicken Salad sounds good too! I remember having one at the original Outback in Tampa. I will be making these this weekend. Sounds really good. Thanks. Its in the oven right now, can’t wait! I hope you enjoyed it! The crunchy onions sound like a nice addition! Followed the recipe & instructions …. this was excellent and easy-to-make ! We enjoyed it very much. Will definitely cook it again for dinner soon. Thanks for a nice meal. Thanks so much for sharing! I’m so glad you liked it. Modified the recipe slightly for my low-carb diet and it came out fantastic! Thank you! Wonderful! I’m guessing you modified the sauce a bit. 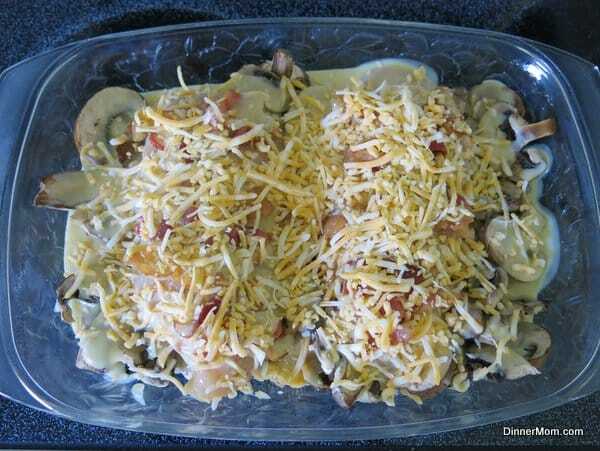 I can enjoy this with just a wee bit of sauce since there is so much cheese, bacon and mushrooms! Wow this looks amazing! We are hosting an AFS student from Germany and she is convinced that we put bacon and cheese on everything. I will have to make this for her just to further confirm her suspicions. Thanks! If she’s been enjoying bacon and cheese…then I’m sure she will love this! I made this for supper tonight. Slamdunk! Thanks for the great recipe I will be making time and time again! Thanks so much for your comment. I’m so glad you liked it!! 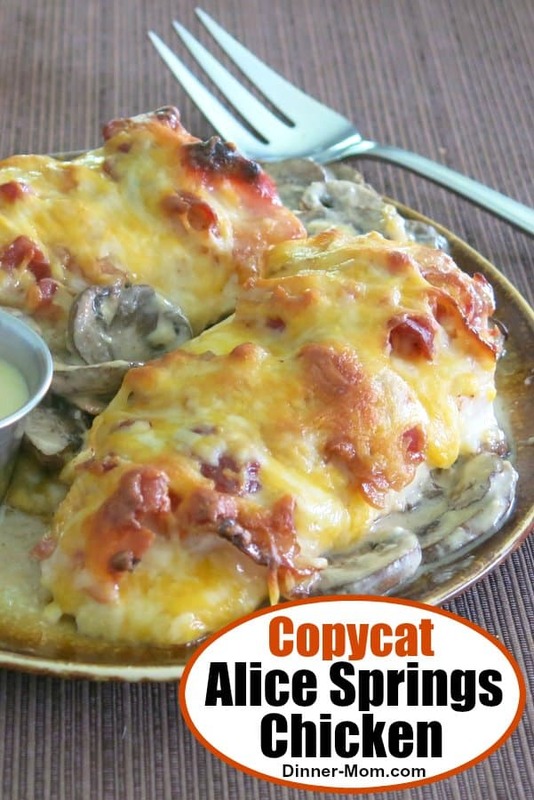 I’ve never been to Outback Steakhouse but this recipe was awesome! 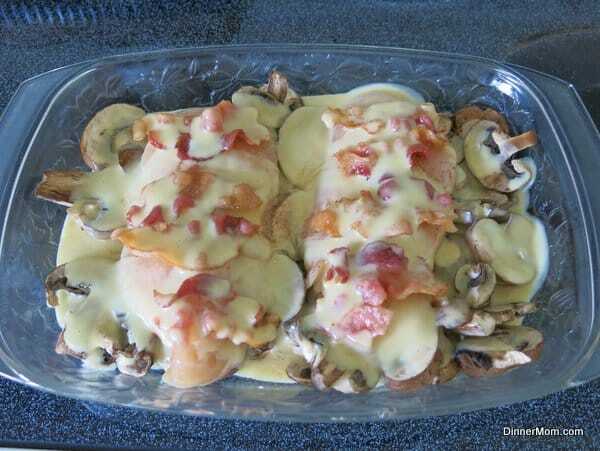 In case anyone else is interested in making the servings a little calorically lighter here’s what I did: used half the sauce, sliced the chicken breasts in half using two large breasts to create 4 thinner cutlets, used double the mushrooms, used half the cheese, and used Hellmann’s light mayonnaise in the sauce. I cooked it in the oven for about 10 minutes 350 then put it under the broiler for another 5 to 10 minutes, until the bacon was crisp and the chicken was cooked through. I love this recipe and wouldn’t feel bad eating this lighter version fairly often! Thanks so much dinner mom! this was my first time trying one of your recipes and I’ll surely be back for more. oops I forgot one thing. I also roasted mushrooms all alone for about 30 minutes before I assembled the rest of the dish. They came out so delicious this way! Thanks so much for stopping by and commenting. I’m thrilled that you liked it. 🙂 Love your tips!!! I’m not familiar with Alice Spring Chicken, but this sure looks tasty! I have never come across this recipe but it sure looks awesome. My husband would love this. Thanks for stopping by and commenting. This is definitely one of my hubby’s favorites! Made this tonight and loved it. Honey mustard is awesome…used regular mustard because I did not have Dijon. Might brown the chicken in a skillet first next time, but flavor is spot on! This meal rocks!! I finally found an awesome honey mustard recipe! This comes the closest to Outback’s Alice Spring Chicken than any other recipe I’ve tried……Delicious!! Thanks for sharing your experience! I’m so glad you liked it! Can this dish be made ahead – either prepped early in the day or maybe cooked and frozen. Yes – you can use both of these methods! do i need to cut the breast to make them thinner….mine are fairly thick…fat! Hi! You can adjust the cook time up for thicker breasts or pound them down a little bit. It’s very helpful to use a meat thermometer if you have one. If I cooked two of this recipe ahead and froze one how would you recommend reheating? You could assemble one without cooking it first and freeze it in an aluminum tin. Make sure the mushrooms are on the bottom so that they are covered by the chicken and sauce and that the honey mustard mixture is well combined. Defrost in the refrigerator and cook as you normally would. Tonight is the first night I am making this recipe like it says. Before I sliced the thicker chicken breasts in half, pounded them, floured them and fried them in butter to brown. I fried up the mushrooms. I used the low fat olive oil mayonaisse with peppercorns and the sauce tasted just as good. I used precooked bacon for the top and lower fat cheddar jack cheese on top. My husband asks for this every week. Tonight I didn’t fry the chicken. I don’t think this recipe is very fattening as long as you don’t load it with cheese. One of these days I will work it out on Sparkpeople recipe maker. (If one uses center cut bacon, it is even less fat yet). Thank you for a wonderful recipe. Love that honey mustard and you are right, it’s perfect. When pounding the chicken and changing the recipe it is no longer Alice Springs chicken, it is merely Kathy’s chicken. I made this for dinner tonight for the first time and it was sooo good. I’ll be making Alice Springs chicken like this from now on. The only thing I omitted was the mushrooms since we don’t care for them. This is my favorite recipe of all time and I don’t have to go out to dinner for it! I get rave reviews every time I make it! you are so good at being able to duplicate restaurant recipes. wondering if you could give me a recipe for Tuscan Chicken from O’Charleys that is not on the menu any more. I loved it!! I’ve never heard of it…but, I sure like the name! I’ll check it out! I am late to this blog post – but just had to comment that the honey mustard sauce is bang on – tastes absolutely perfect. Made it for my cooking club ladies and they loved the dish. I loved It! One of the best recipes we have had! I made this tonight for my mom, Alice Springs Chicken is her favorite! We were all amazed!!! Absolutely fabulous!!! Definitely a keeper. Thank you for sharing. Absolutely wonderful! I’m so glad you liked it! Thanks for your feedback! Well since this page seems to still be active I thought I better tell y’all I already made this one time, it was a hit! And the oven is pre-heating for it this evening! We eat keto so this is perfect, we just don’t use as much honey mustard. Thanks for the great recipe! Hello 😊 can’t wait to make tomorrow for dinner. I want to make in a 9/13 pan and double recipee. Do I need to bake for longer? 😊😊 thank you so much! Hi! You will likely need to cook it for a little longer, maybe 10 minutes. We strongly suggest that you use a food thermometer since the cook time will vary depending upon thickness of the chicken. However, if you don’t have one, then check it at 30 minutes and go from there. Also, try not to overlap the chicken in the dish. I hope you enjoy it!! Loved the honey mustard sauce. I put the honey in the micro as was suggested. Then added the other ingredients. It is very tasty. Thank you! I did not like the honey mustard sauce. I think that 3/3 us better! 1 part mayo; 1 part honey and 1 part grey poupon mustard. This was so good. I added a little lemon to the honey mustard sauce and it was even better. I broiled it for the last minute or so to crisp the bacon and cheese. Delicious! Thanks for sharing this recipe! I’m so glad you enjoyed it! Thanks for your feedback!